Previews: 7/22, 2-4 pm; 7/23, 3-6:15 pm or by appt. Porcelain & Glass; Map; Books, etc. SCULPTURE: Modern bonsai form brass coffee table in the manner of Willy Daro, glass top; Franz Bergman cold painted bronze, early 20th C., 7½” h.; Pal Kepenyes “Tendency to Infinite,” 1985, abstract bronze, 25½” h.; Emile Joseph Nestor Carlier bronze, 18¼” h.
PRINTS & DRAWINGS: David Young Cameron etchings (2); Leon Danchin lithograph; Michiel Theobald Gloeckner lithograph; Richard Harden mezzotint; Erik Guide Haupt etchings (5); Norman Kramer black crayon on paper; Bertha Lum prints (2); Conrad Hope Lomax etchings (2); Andre Minaux lithograph; Hendrikus Elias Roodenburg etchings (4); Georges Rouault aquatint over heliogravure; early architectural engravings (8) incl. Italian & English bldgs. ; Asian woodblock prints (see Asian). 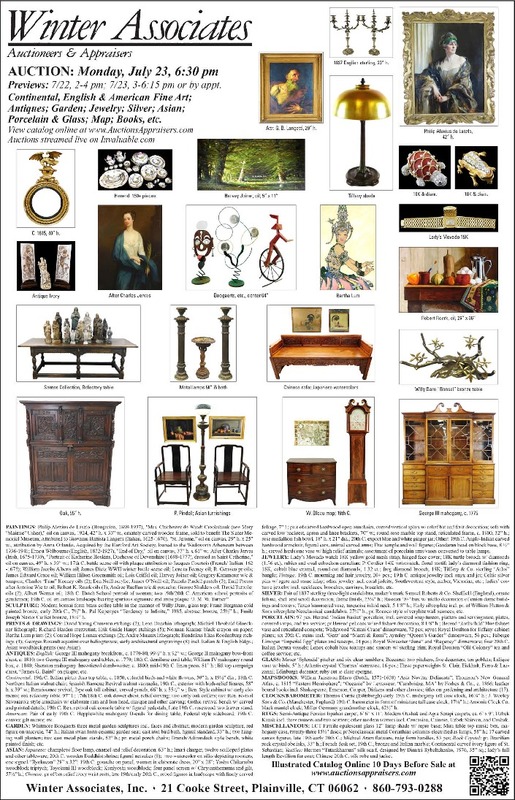 ANTIQUES: English: George III mahogany breakfront, c. 1770-80, 99½” h. x 92” w.; George II mahogany bow-front chest, c. 1810; two George III mahogany card tables, c. 1770; 18th C. demilune card table; William IV mahogany round box, c. 1840; Sheraton mahogany three-tiered dumb-waiter, c. 1800; mid-19th C. linen press, 81” h.; lift top campaign chest, “James G. Baird” on plaque; etc. Continental: 19th C. Italian pietra dura top table, c. 1850, colorful birds and white flowers, 30” h. x 19½” dia. ; 18th C. Northern Italian walnut chair; Spanish Baroque Revival walnut vargueño, 19th C., exterior with high-relief figures, 58” h. x 39” w.; Renaissance revival, 2-pc oak tall cabinet, carved panels, 66” h. x 55½” w.; Ren. Style cabinet w/ early elements; oak refectory table, 97” l.; 17th/18th C. oak dower chest, relief carving; two early oak coffers; two Ren. Revival Savonarola style armchairs w/ elaborate ram and lion head, masque and other carving; Gothic revival bench w/ carved and painted details; 19th C. Ren. revival oak console table w/ figural pedestals; Late 19th C. rosewood two drawer stand. American: Pair of early 19th C. Hepplewhite mahogany D-ends for dining table; Federal style sideboard; 19th C. convex gilt mirror; etc. GARDEN: Whitmore Boogaerts three metal garden sculptures incl. faces and abstract; modern garden sculpture, red figure on unicycle, 74” h.; Italian swan form ceramic garden seat; cast iron bird bath, figural standard, 33” h.; two hanging wall planters; two cast metal plant stands, 52” h.; pr. metal porch chairs; Branch/Adirondack style bench, white painted finish; etc. ASIAN: Japanese: champlevé floor lamp, enamel and relief decoration, 63” h.; Imari charger, twelve scalloped plates and other tableware; 20th C. wooden Buddhist shrine; figural netsukes (8); two watercolor on silks depicting roosters, one signed “Ryokuzan” 28” x 32”; 19th C. gouache on panel, woman in elaborate dress, 20” x 28”; Yoshu Chikanobu woodblock triptych; Toyokuni III woodblock; Kuniyoshi woodblock; four panel screen w/ Chrysanthemums and gilt, 57½” h.; Chinese: pr of bas relief ivory wrist rests, late 19th/early 20th C., robed figures in landscape with finely carved foliage, 7” l.; pair of carved hardwood open armchairs, curved vertical splats w/ relief bat and fruit decoration; sofa with carved low backrest, apron and knee brackets, 70” w.; round rose marble top stand, reticulated frame, c. 1900, 32” h.; rose medallion fish bowl, 18” h. x 21” dia. ; 20th C. export blue and white ginger jar; Other: 19th C. Anglo-Indian carved hardwood armchair, figural ears, animal carved arms; Thai temple and wall figures; Gandaran head on block base, 8 ½” h.; carved hardstone vase w/ high relief animals; assortment of porcelain urns/vases converted to table lamps. 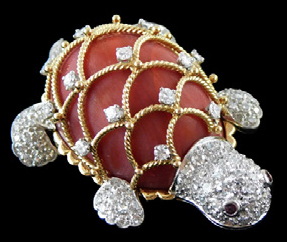 JEWELRY: Lady’s Movado watch 18K yellow gold mesh strap, hinged face cover; 18K turtle brooch w/ diamonds (1.76 ct.), rubies and oval cabochon carnelian; P. Cordier 14K wristwatch, floral motif; lady’s diamond fashion ring, 18K, cobalt blue enamel, round cut diamonds, 1.32 ct.; frog diamond brooch, 18K; Tiffany & Co. sterling “Atlas” bangle; Vintage: 19th C. mourning and hair jewelry, 20+ pcs. ; 19th C. antique jewelry incl. onyx and jet; Celtic silver pins w/ agate and stone inlay; other jewelry incl. coral jadeite, Southwestern style, amber, Victorian, etc. ; ladies’ costume jewelry incl. necklaces, brooches, earrings, bracelets, etc. SILVER: Pair of 1837 sterling three-light candelabra, maker’s mark Samuel Roberts & Co. Sheffield (England), ornate foliate, shell and scroll decoration, flame finials, 23¾” h.; Russian ‘84’ box w/ niello decoration of onion dome buildings and towers; Taxco hammered vase, turquoise inlaid neck, 5 1/8” h.; Early silverplate incl. pr. of William Hutton & Sons silverplate Neoclassical candelabra, 27¼” h.; pr. Rococo style silverplate wall sconces; etc. PORCELAIN: 97 pcs. Herend ‘Indian Basket’ porcelain, incl. covered soup tureen, platters and servingware, plates, covered soups, and tea service; pr Herend pelicans w/ red fishnet decoration, 8 1/8” h.; Herend ‘Rothschild’ blue fishnet vase and reticulated compote; Wedgwood ‘Kutani Crane’ dinnerware, 72 pcs; seven Royal Doulton for Tiffany cabin et plates; six 20th C. steins incl. ‘Gerz’ and “Marzi & Remi”; Aynsley “Queen’s Garden” dinnerware, 56 pcs. ; Faberge Limoges “Imperial Egg” plates and teacups, 24 pcs. ; Royal Worcester “June” and “Regency” dinnerware; four 20th C. Italian Deruta vessels; Lenox cobalt blue teacups and saucers w/ sterling trim; Royal Doulton “Old Coloney” tea and coffee service; etc. GLASS: Moser ‘Splendid’ pitcher and six clear tumblers; Baccarat: two pitchers, five decanters, ten goblets; Lalique vase w/ birds, 5” h.; Atlantis crystal ‘Chartres’ stemware, 16 pcs. ; Three paperweights St. Clair, Eickhalt, Ferro & Lazzanni; Edinburgh decanter; ruby cut to clear epergne. MAPS/BOOKS: Willem Janszoon Blaeu (Dutch, 1571-1638) “Asia Noviter Delineata”; Thomson’s New General Atlas, c. 1815 “Eastern Hemisphere”; “Oceanie” by Levasseur; “Cambridge, MA” by Forbes & Co., c. 1866; leather bound books incl. Shakespeare, Emerson, Cooper, Dickens and other classics; titles on gardening and architecture (17). CLOCKS/BAROMETER: Thomas Currie (Edinburgh) early 19th C. mahogany tall case clock, 86¾” h.; J. Wooley Sons & Co. (Manchester, England) 19th C. barometer in form of miniature tall case clock, 17¼” h.; Ansonia Clock Co. black mantel clock; Miller Germany grandmother clock, 62½” h.
RUGS: Semi-Antique Persian Ispahan carpet, 6’ 6” x 11’; Modern Oushak and Agra Serapi carpets, ea. 6’ x 9’; Uzbek Kazak incl. three runners and two scatters; other modern scatters incl. Caucasian, Chinese, Uzbek Shirvan, and Oushak. MISCELLANEOUS: LCT Favrile opalescent glass 12” lamp shade w/ repro base; Mira table top music box, mahogany case, twenty-three 15½” discs; pr Neoclassical metal Corinthian columns electrified as lamps, 58” h.; 17 carved santos figures, late 19th/early 20th C.; Michael Aram flatware, twig form handles, 53 pcs; Rock Crystal: pr. Brazilian rock crystal obelisks, 33” h.; French desk set, 19th C., bronze and Italian marble; Continental carved ivory figure of St. Sebastian; Textiles: Hermes “Tutankhamun” silk scarf, designed by Dimitri Rybaltchenko, 1976, 35” sq. ; lady’s full length Revillion fur coat; Chinese 20th C. silk robe and jacket. Attr. G. B. Langetti, 29” h.
Philip Alexius de Laszlo, 42” h.
1837 English sterling, 23” h.